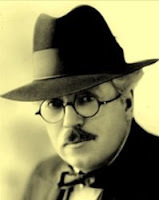 Frank Bridge was an English violinist and composer born on February 26, 1879 (Brahms was 46 years old.) From 1899 until 1903, he studied at the Royal College of Music. He played the viola in a number of string quartets before going into composition. He also taught privately. He wrote a considerable amount of chamber music, now played mostly in England. He is also famous for something called the Bridge chord which is simply a Major seventh chord with a flat nine and major thirteenth thrown in – nothing unusual. There are numerous recordings of his music available. Bridge died in January, 1941.